“Welcome to Middle Earth!” A huge sign at the Auckland airport greeted us with these words the minute we stepped off the plane. It was a fitting start to our literary adventure through New Zealand, where The Lord of the Rings trilogy was filmed. 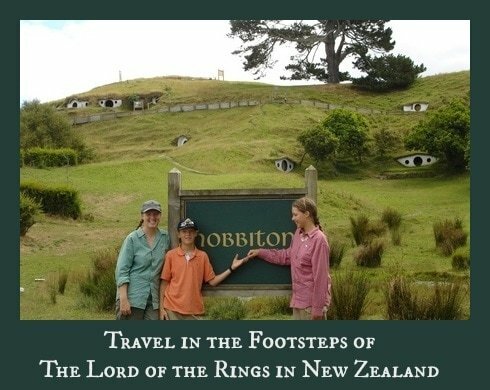 Here is how to travel in the footsteps of Lord of the Rings in New Zealand. 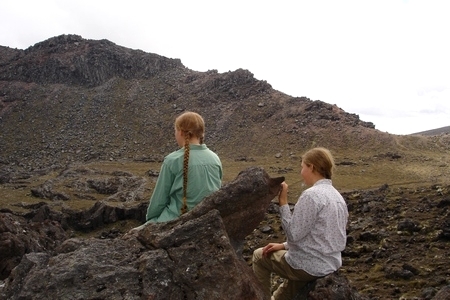 It was entirely the kids’ idea to go to faraway New Zealand from our home in Sweden. Diehard J.R.R. Tolkein fans, all three of our teenagers knew the three-hour long dialogue from the first Lord of the Rings film by heart. They had read the books, both in English and in Swedish, as well as a couple of autobiographies by the actors. They had made their own cloaks (which they wore wherever we went), studied Elfish and did lots of role playing with their friends. Now they wanted to visit “the real place.” Since my husband and I are firm believers that kids learn loads when they can immerse themselves with their interests, we took up the idea immediately. Our next stop was a bit darker, Mordor. The scenes for this horrific place were actually shot at a ski resort on Mount Ruapehu! If you look away from the ski lifts and forget the parking lot (where they shot the battle scenes in the beginning of the first movie) you can imagine this place as the home of darkness and evil. The mountain was made of hardened black lava, as it’s a volcano, and it was surrounded in eerie mist. We set forth on a quest to find the river where, in the movie Gollum caught a fish and ate it raw. Since we had our terrific guide book, containing both maps as well as pictures from the movie, we found the exact place outside the village of Ohakune – we even recognized the rocks! So, we now have our own filmed version of the scene, with our youngest crawling in the ice cold water as Gollum, while the other teens stood on guard as Sam and Frodo. It was hilarious to make and still every time we watch it we roar with laughter. Our expedition took us to the capital, Wellington, a pleasant town at the southern part of the North Island. Smack in the middle of the city at lovely Mt. Victoria Park was where they shot the famous scary scene where the hobbits are hiding under a tree root while the Nazguls rode just beside them. It was interesting to see how the camera can twist reality! 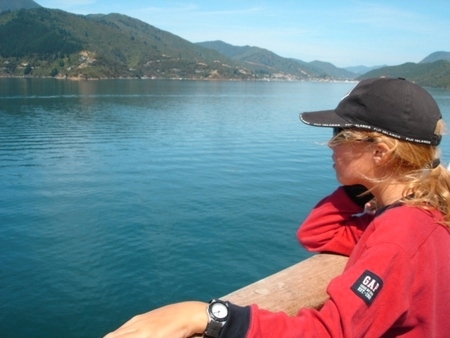 The ferry ride between New Zealand’s North and South Islands is amazingly beautiful! In Wellington, you also find The Embassy Theatre where they had the world premiere for the third film in the trilogy. Of course, we had to visit this movie theatre before we took off for South Island. The ferry ride between the two islands was absolutely breathtaking; this alone could be worth a trip to New Zealand! 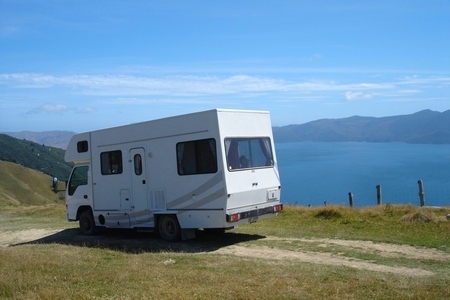 There are many places on the South Island to visit if you want to follow in the footsteps of Frodo, Sam, and the others but we decided to save that for another trip. Instead we spent our time here watching whales, swimming with dolphins, and visiting friends. From awe-inspiring scenery, the friendly and laidback locals (affectionately called kiwis), and Lord of the Rings lore…New Zealand is a fantastic spot for a family vacation. We often talk about going back, so it’s probably just a matter of time! Have you embarked on a themed trip like Maria and her family? Tell us about your experience in the comments! Maria Berkestam is a world traveler and homeschooling mom.Together with her husband and three (almost grown-up) children, she runs the Extended World Travel blog, for families considering traveling together for six months or longer. She and her husband, Magnus Drysen, also wrote the e-book Extended World Travel – How to take a break from the rat race and travel the world with your family for 6 months – or more! Love love this post.. because I have been dreaming about doing the exact same trip in the future. Maria – Thanks so much for writing a guest post for Travel Mamas! I have to admit, I’ve never read the stories or even seen the Lord of the Rings movies. However, my husband was quite excited about the story! 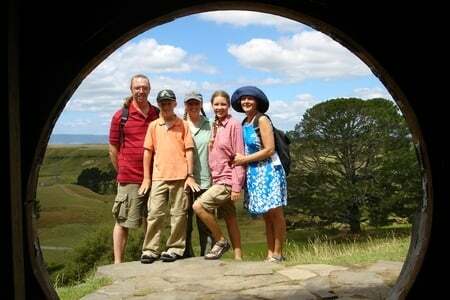 Amy – I hope you’ll be able to take the family on your own LOTR New Zealand trip someday. (Knowing you, I’m sure you’ll make it happen!) I checked out your post…wow…there’s even a Hobbiton Motel. Who knew?! Glad I could remind you of your old dream 🙂 Maybe it’s time to act on it! I read your dreaming post and it seems a lot similar to what we really did. NZ is a fantastic place with, not “only” the LOTR things, but also amazing nature and fantastic people. I do recommend you to have plenty of time when you go to NZ, there’s so much to see. It was great to get an opportunity to be reminded of our fantastic trip to NZ by writing! Wow!such a great idea to travel in the footsteps of an adventure book! I am not planning on travelling to New Zeland, but my daughter is a great fan of Harry Potter, anyone knows any itinerary in the footsteps of Harry Potter in England??? I have a friend in New Zealand who will enjoy reading this story. I look forward to hearing her reaction to it. I don’t have kids yet, but I hope to! And I definitely want to take a trip to New Zealand to see those breathtaking sites from the movies. New Zealand has always seemed to me a place that holds the beauties of many places in a very concentrated form, which is why they must have used it to represent Tolkien’s magical world! Oh my goodness, my kids would be in absolute heaven here! What an amazing experience! Though not a die-hard fan, I enjoyed the LOTR books and movies. It’s fun to see your photos of the locations where scenes were shot. What a fun adventure for your family! Gretel – You are lucky, indeed! New Zealand is such a beautiful country!